Got this in an email. Not targetted. Good deal if you can go splitsies. Buy any unit and get an Arizer Air free. Cheapest unit is 154.99 (Original Arizer Solo). Last edited by esoxhntr on Feb 28th, 2019 1:15 pm, edited 2 times in total. Can anyone give an honest review on this vape? Arizer Air and Solo are one of, if not the best, units in this price range. Apparently they're like the OnePlus of vapes, top notch (NPI) quality at a proper price. Slightly more expensive than the deal that occurred during legalization, but still a great deal. I was able to sell the Air for $140 very quickly in Winnipeg, so that's a great way to recoup some of your costs. You can't go wrong with any of their devices, but would recommend the Air II or Solo II without hesitation. I've had my Solo for 4 years. Now, the battery isn't as long-lasting, but it still provides the same vaping ability as new. Other than the glass stem, the hardware is durable. If you get one, make sure you use it "hamster style" for the first few hits to prevent weed from falling onto the heating element. That saves a lot of cleanup. I've had the Arizer Air 1 for a 3-4 years now but I no longer use it as I've upgraded. It was a great vape in terms of quality but I would say the only thing against it compared to newer vapes now is that it takes 1 minute to heat up whereas new vapes are almost instant. Arizer does make quality products and is a Canadian company. Canadian product = Cheap replacement parts. For comparison, the German competitor (Volcano) parts are 3x/4x more expensive. 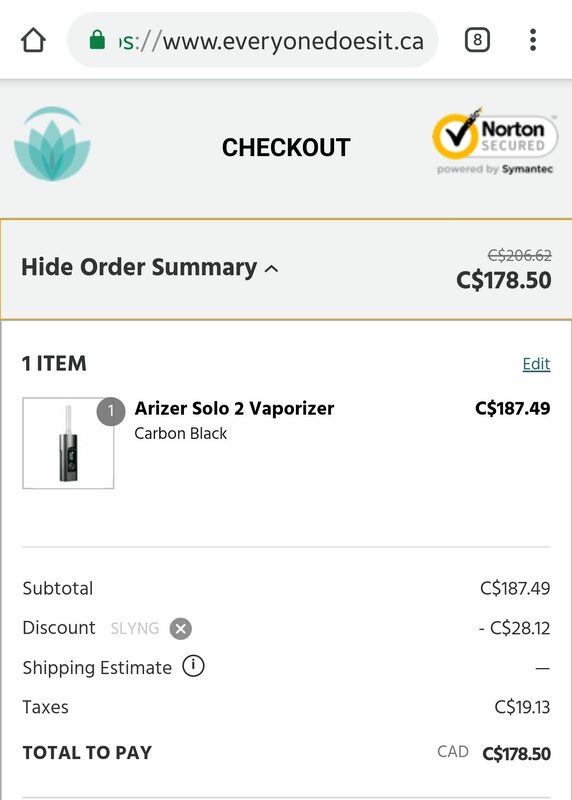 If you want to skip out on the Arizer Air, you can get the solo II for around ~180 tax in, depending where you are if you use the discount code. I started with the Original Solo and it has been a great unit for me. At the time of legalization they ran this promotion and I picked up an Extreme Q and got the Air free. I barely use the Extreme Q as I don't have a good spot to keep it set up at the moment, but still a good quality product. Now I pretty much use the Air exclusively as it is small, effective, and it works great with the water pipe attachment. One of the best quality vapes you can buy. They use medical grade material and are built to last. I used the Air 1 for 5 years before upgrading to the Air II. The fact they are a Canadian company is icing on the cake. If you're looking for a quality vape you really can't go wrong with any of their vapes. Such a quality product backed by a quality company. I have the Arizer ExtremeQ, Solo and Air, I can honestly say that I use the Air more than any of the other devices, it pulls great with the mouthpiece, is small enough to transport, and has a removable battery for times you are not near a plug. The ExtremeQ works as it should and produces large easily inhaled vape, and the bag aspect is quite smooth, but it is slightly more of a hassle in terms of all the accessories and clean up etc. As for the Solo, it was fantastic to me when I had nothing to compare it to, but it is not very portable, inhaling from the all-glass stem resembles a crack pipe when in public, and it pulls hard (i heard these issues were fixed in the "II" version. I would highly recommend Arizer for vapes as it is easy to use and cheap to replace parts. I agree with you but an easy fix with a $10 black pipe replacement. This is what I did and now mine looks like a normal vape when in public.